Built with a breathable material to increase air flow and stop overheating, this backpack has been built for all Australian weather conditions. Waterproof zippers are used throughout and every backpack is fitted with a reflective trim for night time walking. You can even customise your hiking buddy with our choice of velcro side labels. The inclusion of a leash attachment point on the front of the backpack gives you extra control over your dog by making turning their body away from something easier to do. When your dog pulls towards something, the front leash attachment point causes them to pivot around their chest toward you. 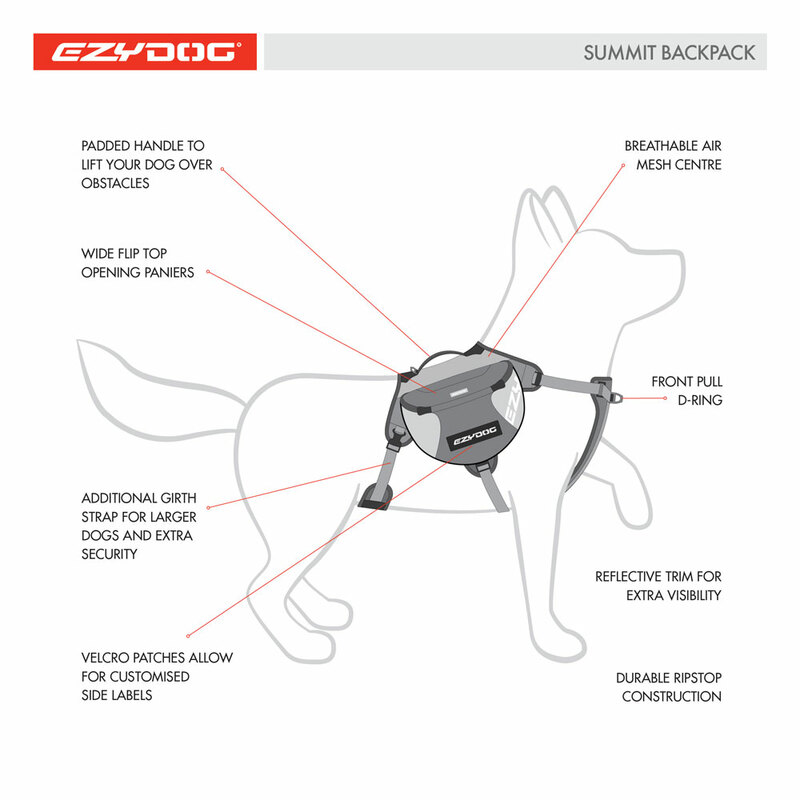 Get your own Personalised Dog Backpack by adding a set of Customisable Side Labels. Just type in your chosen text, whether it’s your Dog's Name, a Nickname, Phone Number or a Personal Message and we'll print it on to 2 velcro side labels that you can attach to either side of your EzyDog Product. Badges securely fit to product with Velcro. One Badge attaches to each side. The use of Stainless Steel D-Rings provides a secure leash attachment point. The heavy duty Ripstop material means that these packs are durable and built to last. Perfect for both small and large dogs. There is even an additional girth strap for extra security for larger dogs or when your dog is making a descent. Add a Small Custom Side Badge. 1 set includes 2 Velcro side labels to each side of the pack. Additional girth strap for larger dogs and extra security when making descents. BUILT FOR FUNCTION, COMFORT AND FUN! For best fit measure the girth and neck of the dog. If the measurement is close to the end of the size range, go up to the larger size. IMPORTANT: DO NOT OVER-TIGHTEN STRAPS! WHEN FITTED CORRECTLY, BACKPACK SHOULD BE SNUG, BUT TWO FINGERS SHOULD EASILY RUN BETWEEN STRAPS & DOG.